Finally we’ll look at one of Italy’s older toymakers, Mercury, and a relative newcomer, Mebetoys. With lots of time to examine real prototypes, and for Mercury at least, with many years of diecast experience behind them, one would expect nothing short of perfection. Alas, these two examples are among the worst. Mercury #4 was introduced in 1965, according to Mercury Tutta la Produzione, by Bocco, Clemente, Coen, Pereo and Pontoni, published in 2005. It is identified as a Giulia Super on the box, but as a Giulia TI on the base (Alfa Romeo made a Giulia TI, a Giulia TI Super, and a Giulia Super, all different). Perhaps pedantic, but according to Wikipedia, the Giulia TI Super was a special lightened road going (but produced for racing) version introduced in 1963. Only 501 were built, all white save for one red and one grey version. They were easily identified by having mesh grills in place of the inner two headlights, and no overriders on the bumpers. The Giulia Super was introduced at the March 1965 Geneva Auto Show and was a regular road-going sedan that incorporated some of the performance features of the earlier Giulia TI Super. My guess is the tooling was underway for a regular Giulia TI when the Giulia Super was introduced at Geneva. It was easy to change the box printing to give the impression that they were first with the latest model, but they never updated the base of the model. That said, they also managed to put a three-spoke plastic steering wheel into the interior, which was a standard Giulia Super feature. But that is the only discernable feature in 1:43. Enough history. The model is otherwise pretty abysmal with half opening doors and a totally incorrect rear window profile. They completely missed the notchback styling with wrap around rear window. The top rear passenger side window profile is incorrect as well, being too rounded. The model comes with opening doors and a separate detailed engine part underneath the opening bonnet. Jewelled headlights adorn the front but rear lights are painted. There is a separate oil pan/ transmission housing casting screwed into the base plate. Bumpers are separate chrome plastic pieces. There is a reasonable attempt at the Alfa Romeo steel wheels. That they are chromed is a good thing, as that provides a barrier between plastic wheels and rubber tires. There is evidence of wheel melt on the inner surfaces of my wheels, but that does not affect displayability. Mercury issued a rallye Giulia version, also as model #4 in 1971. Bumpers were removed with the holes thru the body filled in, and additional spotlights were cast in the grill. Jewelled headlights were deleted, but the remainder of the casting looks unchanged. I have seen one of these on eBay for hundreds of euros, possibly the most expensive early Giulia you can buy. I have seen replacement racing decals online, so caution must be exercised if one is in the market for an original version. 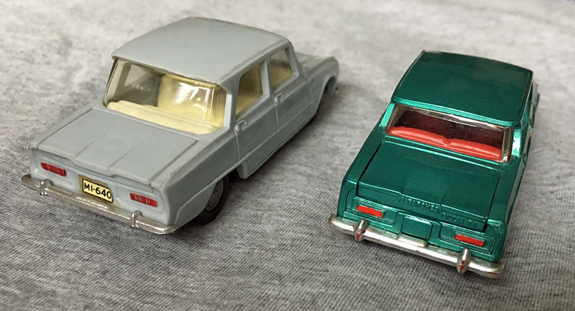 Although the Mercury scale is listed as 1:43, it is noticeably larger than the Edil and French Dinky 1:43 versions. 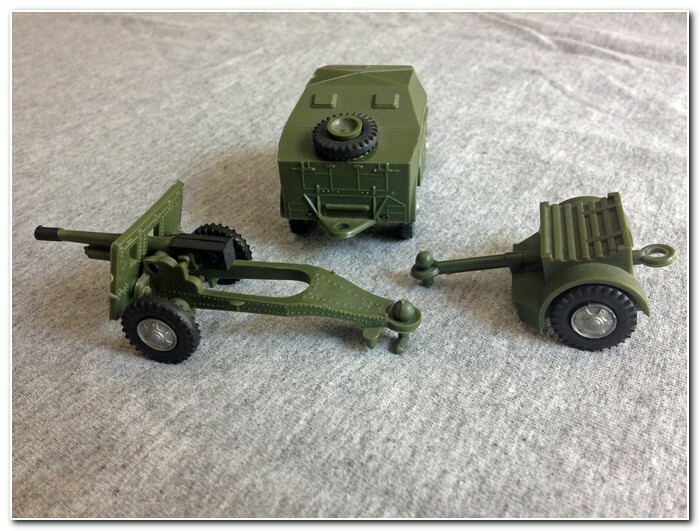 The wheelbase is exaggerated, being longer than the (claimed) 1:42 Mebetoys and also longer than the two 1:41 plastic models from Politoys and INGAP, so something was amiss at the design stage. 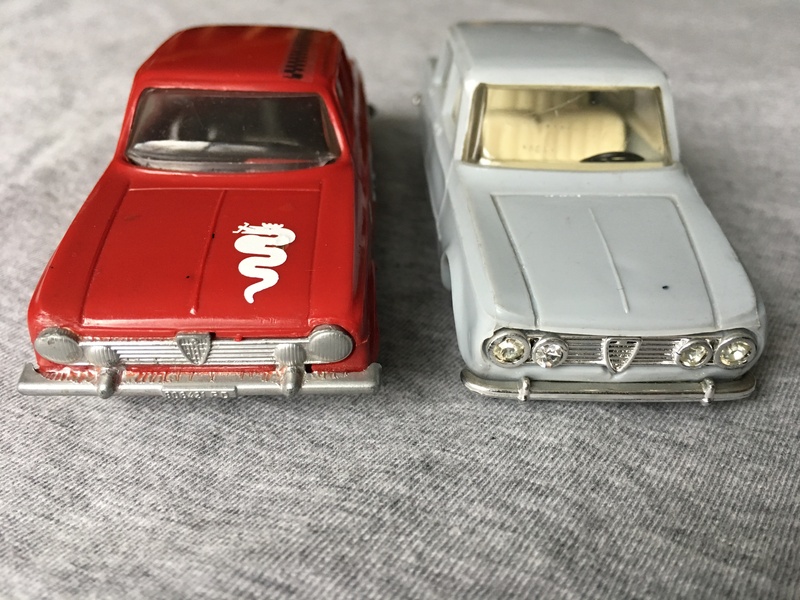 Mebetoys was the most prolific of the early Giulia modelers, producing a regular TI in many versions starting in 1966, a Giulia Super from 1968, and later, a Nuova Giulia with horrible whizzwheels from 1978. 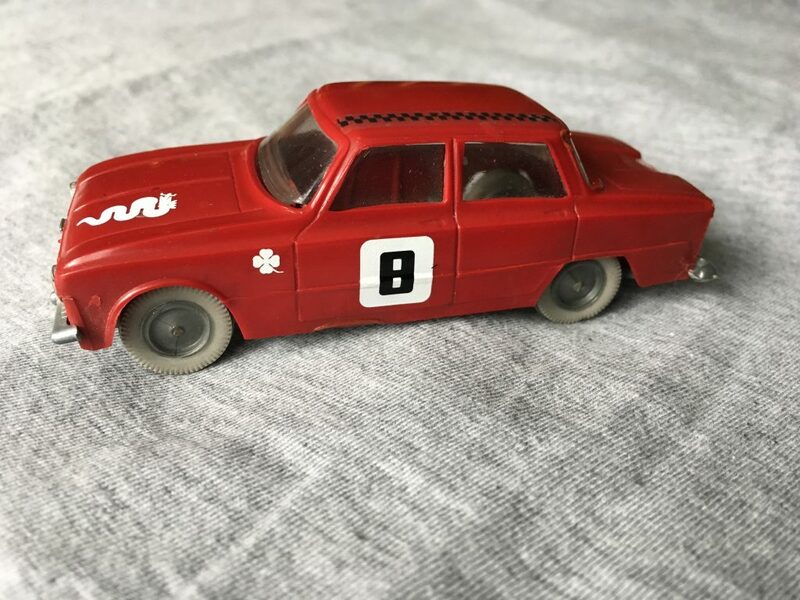 I have not seen in the flesh a Giulia Super from Mebetoys and suspect it may be a nomenclature version (or just the addition of a three spoke steering wheel). The Nuova is a casting change. If anybody has a Super, can they please send a photo to the editor. I have seen a Nuova with earlier more accurate wheels on eBay, but suspect it may be a fake. The base on the Mebetoys attaches with screws, so all bets are off when it comes to purported wheel and interior colour variations. The model came with opening front doors, less quarter windows, chromed plastic bumpers, front and rear, a chromed one-piece plastic insert for the headlights and grill, and working suspension. There were no jewelled headlights, like most of the other models in this review. 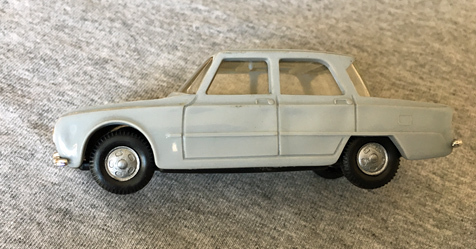 The scale is cast as 1/42 on the base, and when placed alongside the French Dinky and Edil, seems about correct – the Mebetoys has a slightly longer wheelbase and body. Curiously, the box is marked 1/43. I don’t have a later variation of the model, so cannot say if the scale on the base was eventually changed to match the box, or vice versa. The improved wheels appeared sometime after 1967, which was the issue date of the model pictured. They look to be quite accurate renditions of the Alfa Romeo steel wheels. I talked about the Edil moulds moving to Turkey, but of course it is well known that Politoys (plastic, fibreglass, and metal) and Mebetoys moulds also travelled to different countries. However, I have never seen a Giulia TI from these early issues reproduced in their new homes. If any reader has proof otherwise, please send a photo to the editor. So there is a summary of the contemporary models issued shortly after the first Giulia TI rolled off the assembly lines. We have highlighted six companies that produced miniatures, some very well, and others less so. I was fortunate to start collecting these in the eighties, since they have more recently become extremely sought after and, accordingly, very expensive. 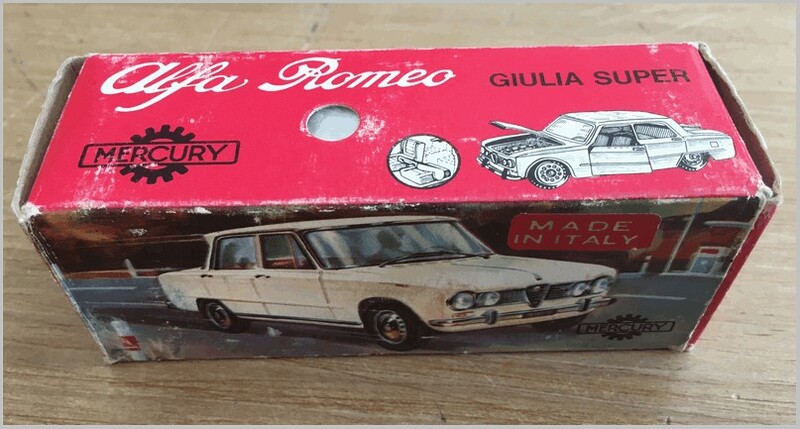 As alluded to in Part 1, next up is the Politoys Giulia TI in 1:41 scale plastic. Most collectors know that Politoys started in plastic, and had a brief foray into “Fibre-glass” (actually resin and I’m pretty sure there were no “glass fibers” used) before settling on diecast metal. I’m not sure where the scale of 1:41 comes from; it could be as simple as a response to the use of the scale by INGAP. In any case, Politoys labelled many of their early plastic vehicles as 1:41, but issued many of the models in totally different scales. The early “Veicoli Militari” series is a prime example (covered in an early print MAR). That said, the Giulia seems to be correct in scale as it compares favourably to the INGAP, and is slightly larger than their 1:43 metal version issued a couple of years later. (I must emphasise that I am not a diehard scale checker). Rampini lists 1964 as the year of issue for the plastic Giulia. I don’t think it captures the style of the original as well as the INGAP, nor do any of the subsequent metal issues from Politoys. To me, the roof is too tall, making the windows too big. It includes many of the features prevalent on contemporary models: glazing, a full interior, jewelled headlights, separate chrome pieces, and suspension. There are no opening features, likely due to strength considerations of the small plastic components that would have been involved. I have always been impressed with the stability of the plastic used by early Politoys. This one features no warping at all, but does suffer from some post-manufacture shrinkage evident in the slight deformation seen in the door panels. It would seem that Politoys quickly discovered the wisdom of diecasting in metal, especially as the toy car market was now demanding a variety of operating features and manufacturers were competing with more and more opening parts. 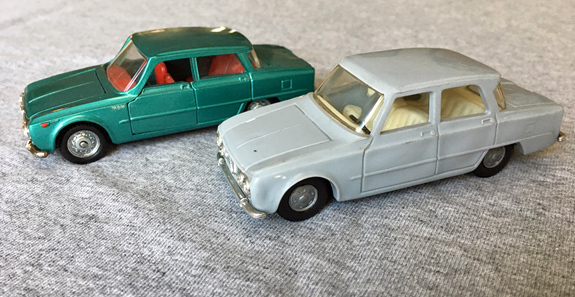 The plastic models had no opening panels; the ‘fibreglass’ models had some (and note, there was no ‘fibreglass’ Giulia), but the big change came with metal toys, and the Politoys M series of models in “proper” 1:43 scale, which first appeared in 1965. There was certainly some overlap between all three mediums (plastic, fibreglass, and metal), but metal was the future. A completely remastered Giulia TI appeared in metal in 1966, as number 523, with opening front doors (half doors, with no window frames), hood and trunk. Typical of the diecasters art of the time, the opening features spoil the lines somewhat. In reality, the rear window is a beautiful wrap around affair, but Politoys managed to square it off at the corners, which really detracts from the rear view. The A pillars are sloped back a little too far; the real vehicle had a more upright windshield profile. Alfa Romeo and Giulia TI are cast into the back of the trunk lid, albeit, overscale. A Carabinieri version was issued in 1967 as number 531 in the M series, with antenna and roof light. The base casting was changed to reflect the new number. 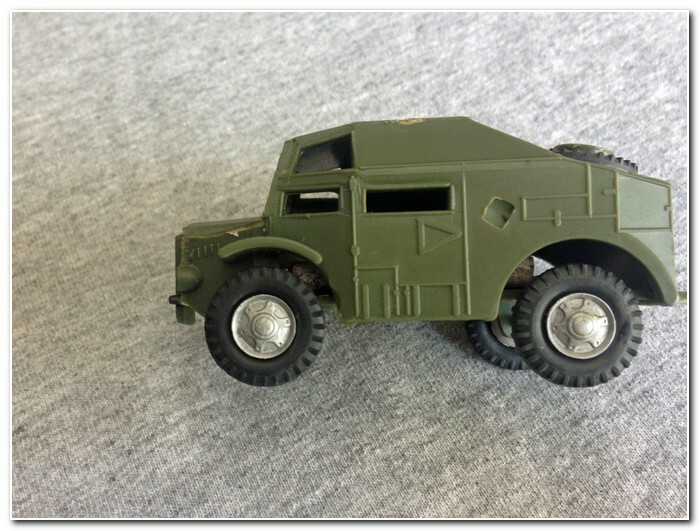 Polistoys introduced the Penny range in 1966, about the same time as the Impy Roadmasters Super Car range from Lone Star. These cars provided competition for Matchbox and were done to a constant scale of 1:66, unlike the other two whose scales varied. The Pennys had lots of opening features, but were not nearly as feature laden as the Impys. Shortly after their introduction, the range was rationalised, and simplified with the loss of opening features. An early catalogue illustrates (as in a diagram) model #0/41 Giulia with opening doors, along with #0/47, a Carabinieri version. However, it was caught up in the rationalisation process and was eventually released in 1968 (after Politoys had become Polistil) as #0/201-A. The Carabinieri version was never released. It is easy to tell that the model is a Guilia, but that is about as generous as one can get. The front windshield is even more sloped than the 1:43 versions, and the interior lacks a steering wheel. Oddly, bonnet and boot shut lines stand proud, while the door lines are indented, with bigger gaps for the front doors. It is possible that the dies had been cut for the original plan of opening front doors, but were reworked when the range was rationalised. Rear and front bumpers, along with grill and headlights are all one chromed casting, making the front end appear way too bright. Wheels are common across the range, a generic (and wrong for this model) set of simulated wire wheels. 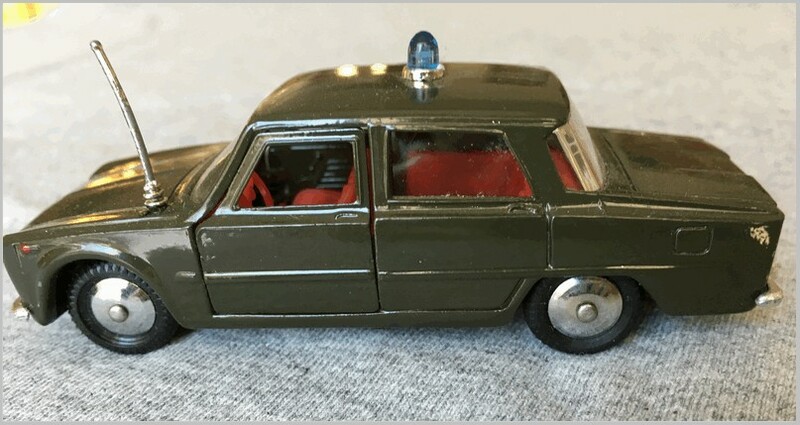 Politoys/Polistil produced other Giulias as well – a 1:20 scale plastic model, a slightly-smaller-than-1:43 estate (station wagon, or familiare), mostly in emergency/police versions (the estate was bodied by Carrozzeria Colli of Milan) in the AE series from the 70s (a nasty model all round, with bad whizzwheels), and a 1:55 Nuova Giulia 1300 from the RJ Series dating from the 80s, also with whizzwheels. It should be noted that many early Politoys dies travelled to Mexico, and were subsequently produced as McGregor Politoys. Plastic, resin and metal models were included, as well as Penny. 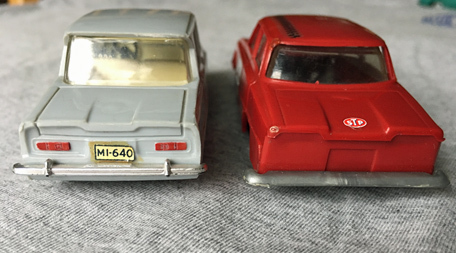 I have no conclusive evidence to prove that any Giulia die travelled to Mexico, but a Dutch Alfa Romeo Forum shows photos of a McGregor Politoys 1:43 Giulia Carabinieri in its box, but not the base of the model. Another site, worthpoint.com (similar to eBay), shows a McGregor Politoys #523 sedan exactly the same as the one pictured above, but the description goes on to say that McGregor imported Made in Italy Politoys, and boxed and sold them as McGregors for awhile. This model was one of those. I’m not what’s commonly known as an “Alfista,” I’m merely a collector who likes a particular style of automobile and the corresponding classic contemporary models. I was first introduced to the Alfa Romeo Giulia four-door sedan in the early eighties while stationed in Germany. A friend had one, a little rough perhaps, but still a very handsome sedan. I mostly observed it in his driveway, with the hood (bonnet) up, apparently with an unending requirement for maintenance. The first release was the Giulia TI (for Turismo Internazionale, an Italian racing series), in 1962 with a 1570cc twin cam four cylinder motor. Production continued until 1977, using various designations that usually referred to engine size. Visually, the basic car changed little except for headlight configuration. The TI had twin headlights, two regular size and two slightly smaller. The Giulia 1300 four cylinder (1290cc) was introduced in 1965, with single headlamps, and the Nuova Giulia was introduced in 1975 with twin headlights all the same size. The Nuova also had flat hood and trunk lids, and, in my opinion, lost some of the original style in the transition. Of course there were lots of other differences between the vehicles over the years, but these generally are not evident in 1:43 scale models of the time. 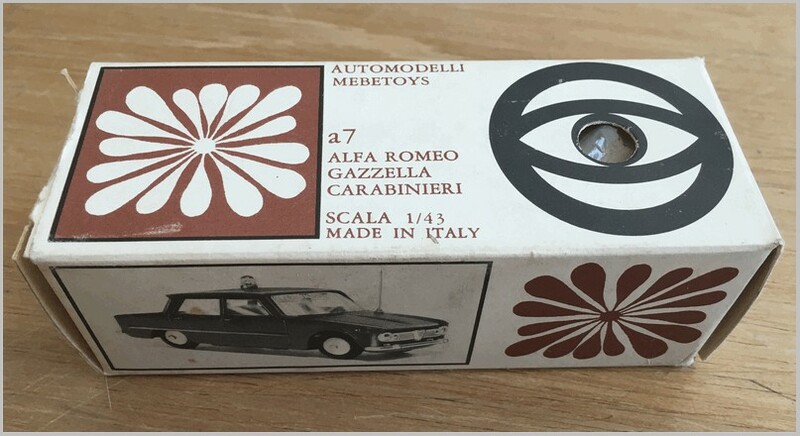 I bought my first model Giulia in 1989, Mebetoys #A7, TI in Carabinieri guise. It comes in other police guises as well as a regular civilian sedan with colour variations. It’s not my intent to detail all the variations, (and I probably couldn’t come close anyway), but this model launched me on a quest to acquire at least one version of all the contemporary, as in 1960s original issues, 1:43(ish) models, all but one of Italian origin. 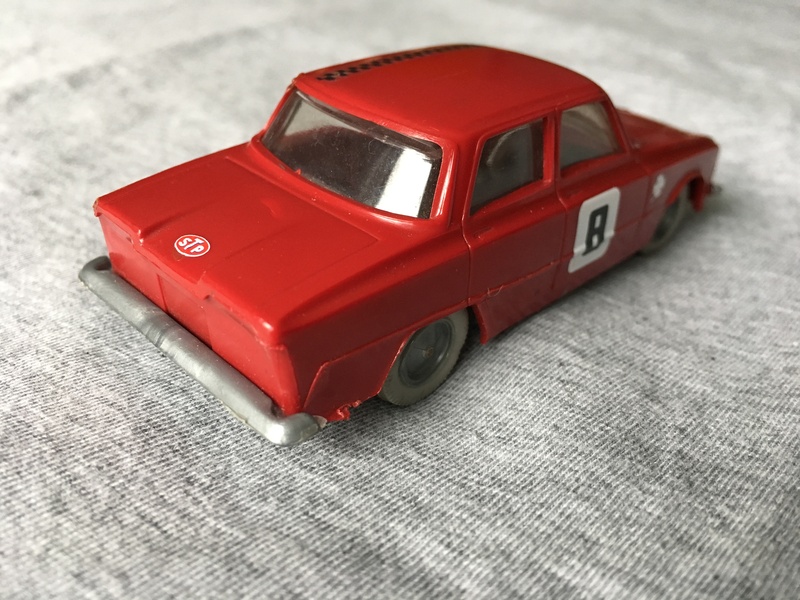 I was recently very lucky in acquiring the last model on my list – an INGAP Giulia TI in plastic. I’ll cover these early models in a general sense, but won’t progress to the many Progetto K Alfas of the 1980s and 1990s, or any of the current diecasts or resins (covered recently by Alex Marsden in the September 2018 issue of Diecast Collector magazine). The last addition to my small collection was the first to be issued in 1963, a Giulia TI by INGAP of Italy. 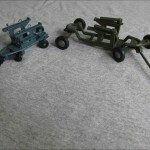 INGAP was founded as a toy company in 1919, but produced mostly plastic and tin toys. Many collectors will be familiar with their set of smaller scale cars, probably around 1:65 scale, which were sold in sets. 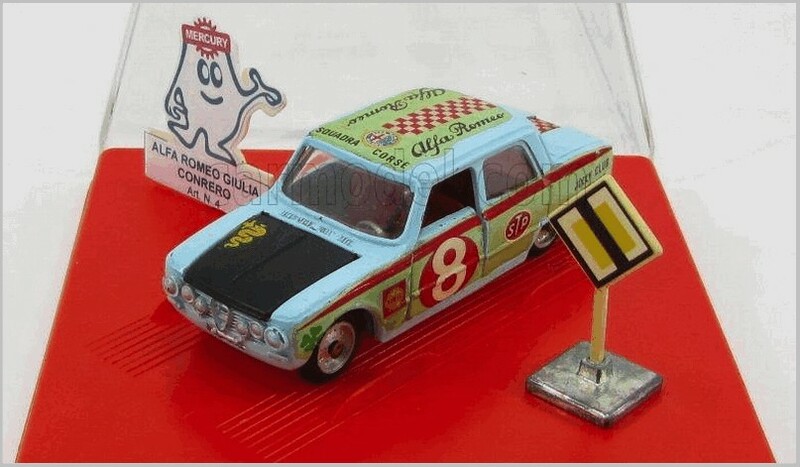 The larger Giulia was sold as one of a “serie 77” consisting of six cars in 1:41 scale. I’m not sure if they were ever sold individually. It was true to form in plastic, with rubber tires, and mine exhibits the slightest evidence of wheel melt (an incompatibility between the plastic rim and rubber tire), but after 55 years it likely won’t degrade any further. This is quite a good model from a company not previously known for “collector scale” toys. These are exceptionally hard to find outside of Italy and now command high prices, as do all the Giulias I will be discussing here. Colours I have seen are a creamy beige (shown on hobbyDB), my red car, and a light blue one illustrated in an article by Andrew Ralston in Model Collector October 2011 (along with the box and the other five cars in serie 77). I’m not convinced that the racing decals on my red version are factory issue, as they seem overscale. I suspect they were added by a collector. But I’ll continue to search the internet for a while to see if another one pops up with decals before removing them. 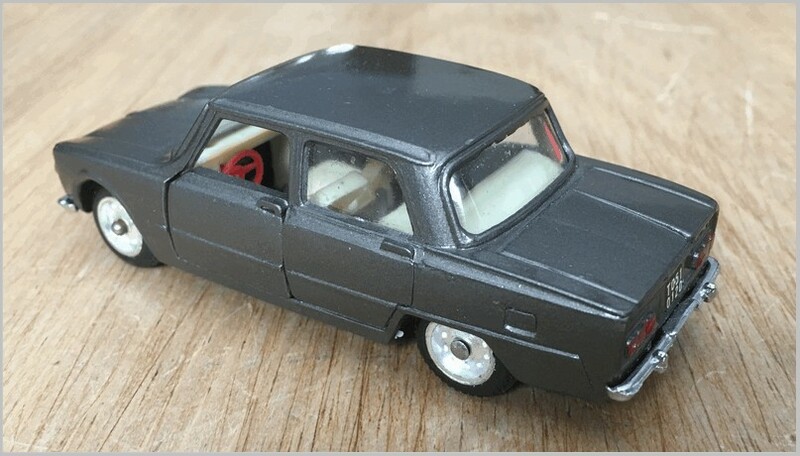 Despite most continental European model cars of 1963 having interiors, this model is lacking (as are the other five in serie 77). Except for axles, wheels and tires, it is a four-piece model – body, base (including rear bumper), windows, and a one-piece, silver painted bumper/front grill/headlight unit, which, in all likelihood, locks the base to the body. Body shut lines are indented, and the overall shape is very good, until you look at the tail of the model. The rear bumper is crudely overscale, and there has been no effort whatsoever to model the taillights. One would think that the brittle plastic used in construction would lead to warping or cracking over time (and it still might in strong sunlight), but my example is as true as the day it came out of the mould. INGAP also produced a 1:15 scale tin clockwork Giulia in its Eurotoys range, but this is beyond the scope of this article. My quest to acquire all the Politoys plastic military range has resulted in new information, for me at least. 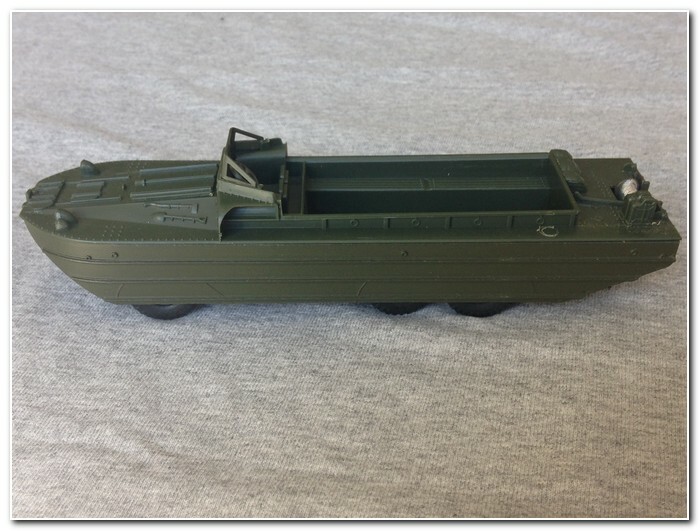 I recently purchased #18, Auto Anfibio (DUKW) from a Mexican vendor. Well actually it’s made by McGregor, that unlikely sounding Mexican company that received many of the old Politoys dies. I’ve never seen a full listing of McGregor production and, until this listing, did not know that the early plastic military dies had also gone to Mexico (even Paolo Rampini does not list them). I don’t have the Politoys version to compare, but the wheels are obviously McGregor originals, and not from Politoys tooling. This is a real shame, as it transforms a reasonably accurate model into a very toylike version, sitting way too high. Usually McGregor added their name to the base and replaced “Made in Italy” with “Hecho en Mexico” but this model has merely had the die ground out a bit to obscure “… in Italy”. It appears also that the die was changed to remove the separately attached spare wheel/tire that was carried on the rear deck of the Politoy. Perhaps the very wide McGregor wheels were unsuitable for this application. 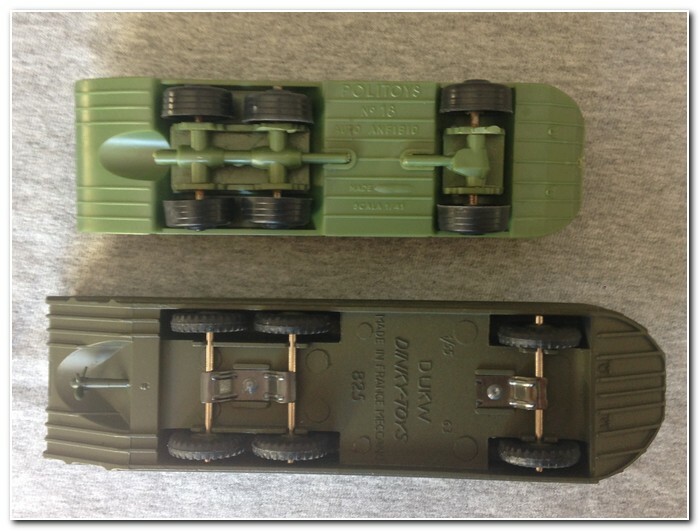 One of the original points in this ongoing series of articles on plastic military vehicles (that started 20 years ago in MAR 109, March 1997) was to compare the Politoys models with the originals from which they were apparently copied. 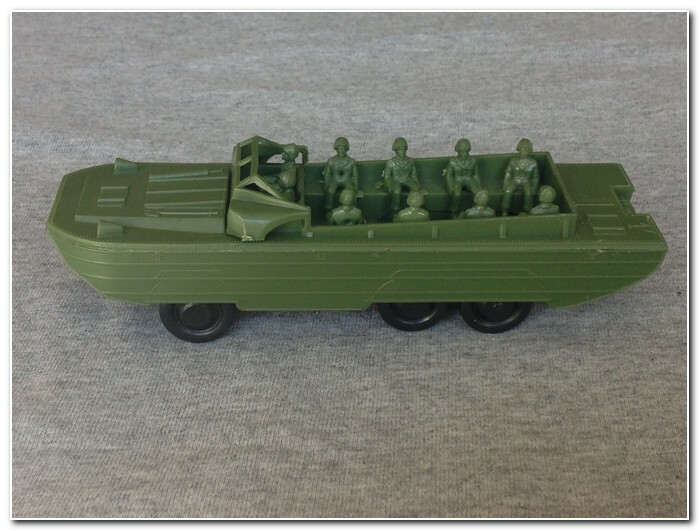 In the very first article, I admitted that I did not know from which original this DUKW had been copied, even though I owned the superb French Dinky #825. A couple of subsequent letters to the editor led to the consensus that it was indeed copied from the French Dinky. But a side-by-side comparison shows that everything about the two models is different (see photos), so I believe this model was not copied from the Dinky, even though release dates are compatible. It should be noted that all the Politoys copies have some subtle differences from the originals (including scale), but these two DUKWs simply do not look to be related. Since these Politoys date from the early 1960s, I’ll have to redouble my search for a contemporary model that may have provided the inspiration. 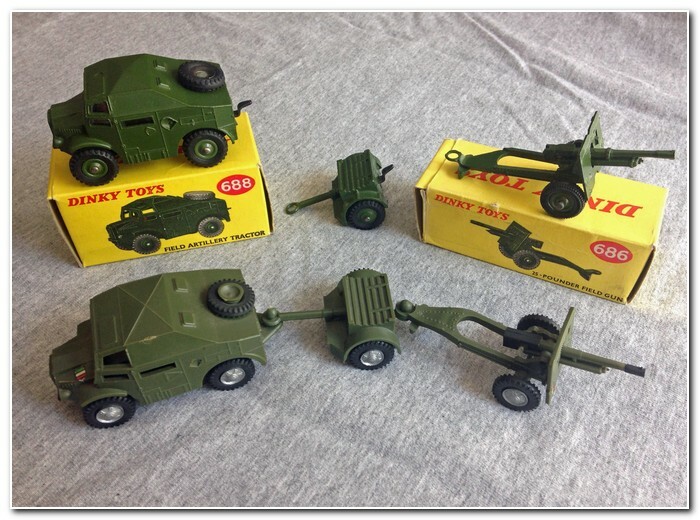 Harvey Goranson’s great post on the real Quad Tractor, Trailer and 25-Pounder Gun, with his reference to the Dinky #697 set, reminded me that I recently acquired the plastic Politoys copy of the Dinky model. 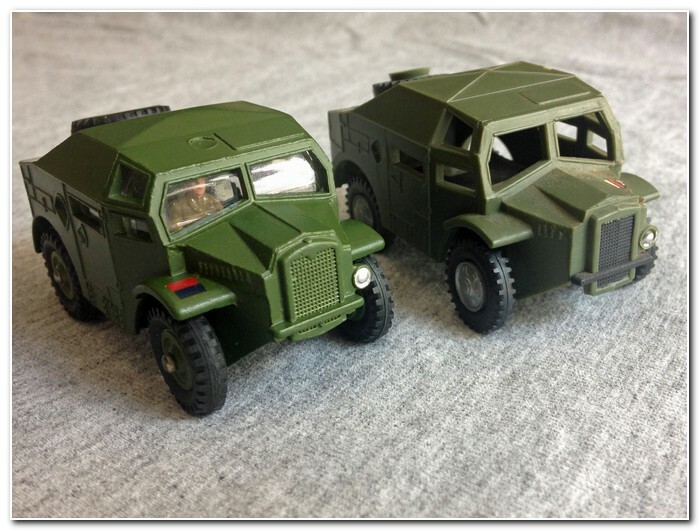 The Politoys is derived from the Dinky, and appears to be to the exact same scale (Dinky used 1:59 for military vehicles, but Politoys calls these plastic vehicles 1:41 scale, clearly inaccurate). Some modifications are evident in the Politoys versions, most likely concessions with the use of plastic, such as pin and hole/hole couplings (with separate pins that can get lost, or broken, like one of mine) to attach the three pieces together. The pin is actually a friction fit into the “top hole” (see pictures). 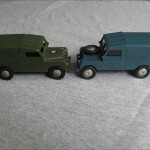 Dinky used a steel “tongue” and die cast metal hole couplings, which would not have had sufficient strength in plastic. 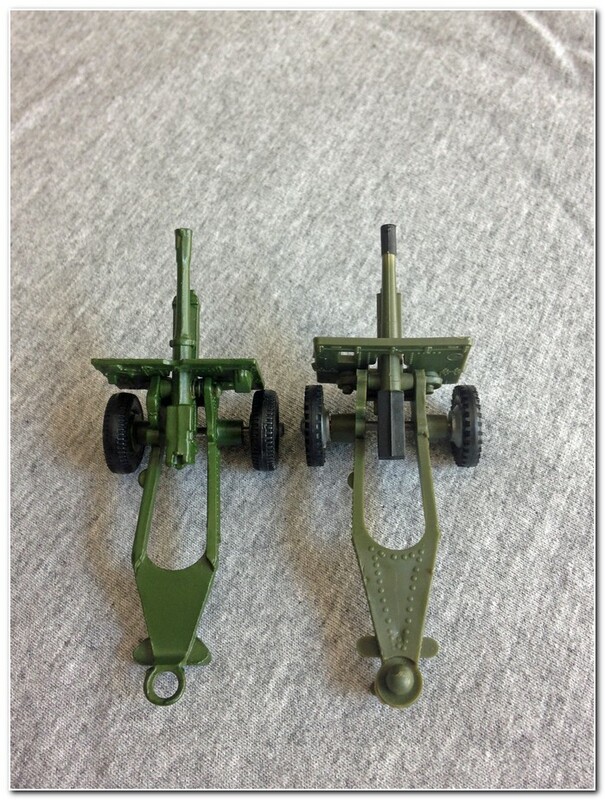 Politoys added some detail, such as bolt head/rivet fasteners on the gun chassis. For some reason other than just using plastic, they also made the Quad Tractor front windows considerably larger, which effectively lowered the hood (bonnet) line. My Politoys Quad has two square metal slugs attached to the inside base of the model, which gives it some heft; they definitely look factory installed, but I don’t know for sure. My Dinky vehicles are separates; the #688 Quad is a later version than Harvey’s, with interior windows and plastic wheels. The #687 25-Pounder is also a later issue with plastic wheels. The Politoys also comes with wheel variations – a patterned wheel and smooth disc wheels, but I’m not sure which came first. 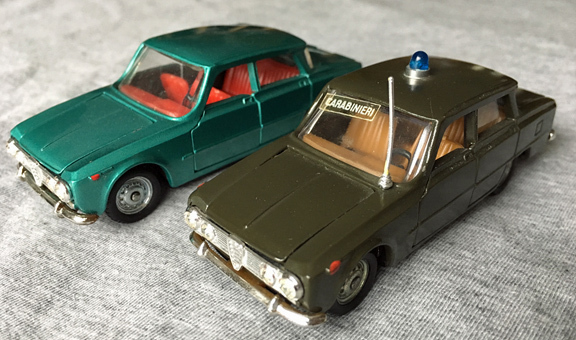 While Dinky sold theirs as a set alongside separate models, the Politoys was only ever sold as a set, #6 in their Veicoli Militari form the early ’60s. 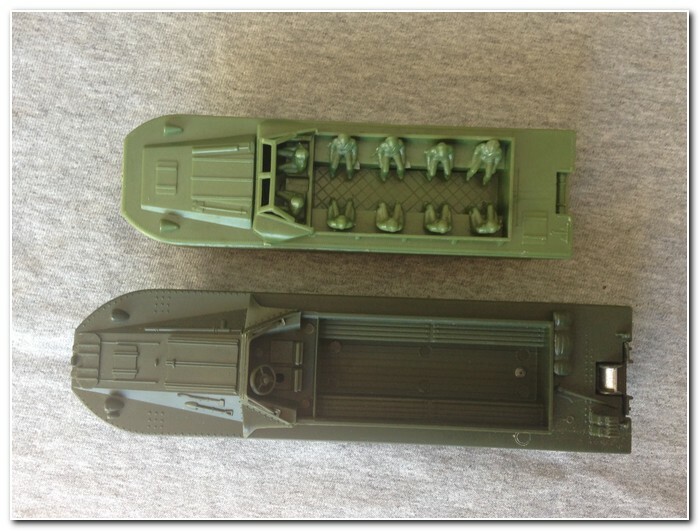 Back in the old days of print, MAR 109 (March 1997) to be exact, I reviewed the long-obsolete Politoys range of 1:41 scale (as stated by the manufacturer) plastic military models. 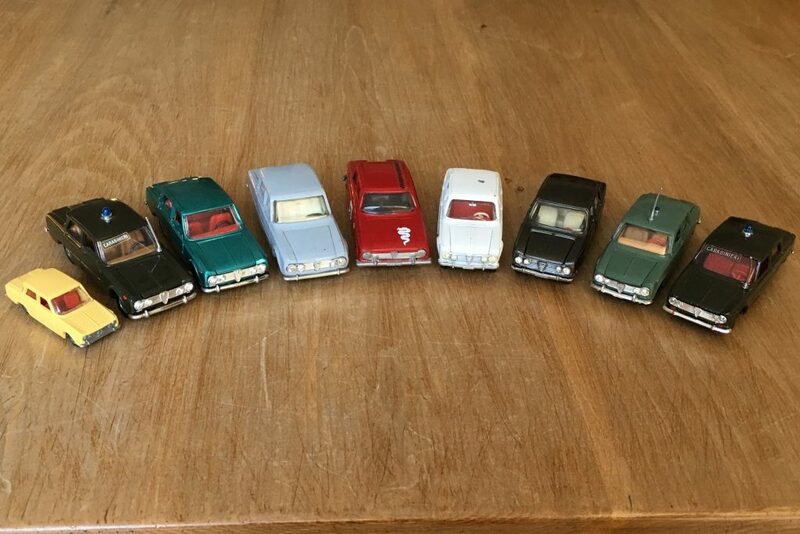 The 19 models in this series were mostly copied from other mainstream diecast manufacturers such as Dinky (UK and France), Matchbox, Corgi, FJ (France Jouets) and Solido. Where I had the original and the Politoys copy, a photograph was provided for comparison in the original article. As I added to my Politoys collection, updates were provided to MAR, in issues 120, 123, 145 and 198. I have finally acquired the the elusive #11, Campagnola Rover Raf con Missile Thunderbird (to quote the box), after 20-plus years on my wants list. 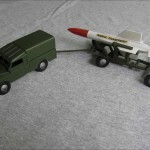 This model is a copy of the original Corgi Land Rover #351 and Thunderbird Guided Missile #350, or I suppose more correctly, Gift Set number 3 which included both models. MAR 148 and 149 had a two-part article on Surface-to-Air Missiles, which discussed the British-designed and built Thunderbird, so I won’t go into any real detail here. The Politoys Land Rover (or Campagnola) is a simpler model than the Corgi, without windows or bonnet spare tyre, but it is an exact scale match (the Corgi is 1:46 scale, according to the Great Book of Corgi). 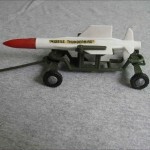 Similarly, the Politoys missile itself is an exact scale match, except that the nose is hard plastic, and thus it is not susceptible to the melting or drooping typical of the Corgi model (see photograph). 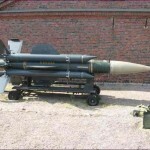 Neither company chose to model a launcher or to include the four booster rockets on the basic missile body. 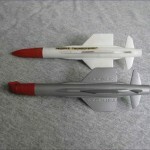 In fact, a ready-to-fire English Electric Thunderbird looked very similar to the other surface-to-air missile modelled by Corgi, the Bristol Bloodhound. A real discrepancy is the Assembly Trolley, where the Politoys model is made to a much larger scale and significantly simplified. Perhaps this was to give extra robustness to the all-plastic structure. Where the Corgi has two wire missile retainers on the trolley, the Politoys retainers are made of separate plastic pieces, pin mounted to the frame, which can easily go missing. The Corgi features two-axle, four wheel steering, via a wire link between the axles, whereas only the Politoys front axle steers. Neither company replicates the Assembly Trolley very well, judging by internet reference photographs. All in all, the Politoys model is difficult to find in mint condition, so even though it is somewhat inaccurate it is a superb model to add to a military collection and to display alongside the Corgi original. I should add that these early Politoys plastic models are of a very stable compound, and are highly resistant to warping, so eBayers can have a reasonably high level of confidence in bidding (I bought mine from eBay in Italy).